Affordable housing for the poor and marginalized gets a facelift in this competition for the most innovative solutions from social entrepreneurs around the world. 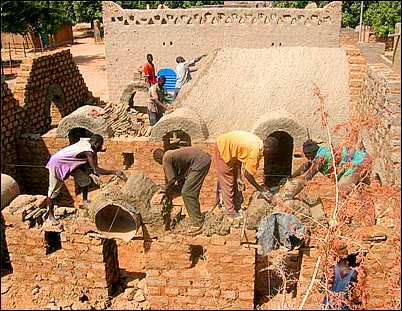 Finalists include a method for providing market-access to poor in Colombo, Sri Lanka, and financing for mobile home owners in New Hampshire, USA, to purchase the land beneath their trailer to vaulted mud brick houses in sub-Saharan Africa and cane-reed contruction with inexpensive in-floor radiant heating in Kyrgyzstan. Here are a range of positive approaches that incorporate design, community involvement, and new technologies and applications. Most hopeful are those projects that promote new ways to use local materials and labor and that encourage community involvement in providing housing. There were 85 entries in the competition, which was begun earlier this year. The entries were assessed for their ability to meet several criteria, including innovation, impact, strategy, and sustainability. You can vote for three from among 13 finalists, but hurry, voting ends a week from today at noon (US eastern). Note: you must supply a valid email address to participate in the voting. Cash prizes of US$5,000 will be awarded to three winners. The Changemakers Innovation Awards series is based on a unique "open source" format by which participants compete for the best solutions to pressing social issues while collaborating to advance current initiatives.